Black Fitness Reality 690XL is a 2016 release, solid and modern and adjustable inversion table with a very strong steel frame and a removable lumbar pillow to support your lower back nicely when you’re inverting or resting. The 3/4 inch foam on the sturdy board with a 1.5-inch steel square frame (board with vinyl padded cover) will support your body- back and head nicely so you can invert comfortably. Both the taller and shorter adults can use this unit comfortably as it can be adjusted for height from 4’10” to 6’6”. Fitness Reality 690XL is easy to put together in about half an hour or so if you have the adjustable wrenches, weighs 61 pounds and can carry a total user weight of around 300 pounds maximum (higher than other budget priced models) and measures 57.09 x 27.17 x 46.06 inches (21.25 inch inside the handrail mechanism) as assembled. It has a folding design and you can fold it (to folded dimensions of 75 x 28 x 18 inches) and move it from room to room comfortably or can be stored in a closet or under the bed. Powder coating on the very sturdy 1.5” square steel frame makes it resistant to scratching. You may also want to keep it in a permanent fixed location as you may want to use it every day. You don’t have to worry about your security as the convenient pull pin release and ankle holders that are composed of two ankle cushions and two foam rollers will keep your ankles and legs safely in place. And you have the tether strap that can also be adjusted so you can invert to different angles up to all the way to full vertical 180 degrees easily and with the foam full loop handles on both sides you can return to your starting upright position easily, without much effort. For those that are not good with numbers, the 180-degree inversion means you can invert completely- hundred percent upside down. There will not be any instability thanks to the heavy duty steel frame and floor stabilizers underneath so you can have a peace of mind. Benefits of using a Fitness Reality inversion table include relaxation of your body, reduced fatigue, relieved stiff muscles, enhanced blood circulation, reduced strain on your back, relieved pressure on vertebrae discs and ligaments, improved body flexibility, better performance in sports and most importantly reduced back pain caused by a variety of reasons. And you need about 5-10 minutes of inverting each day to reap the benefits according to the manufacturer and there are many customers online that claim to have resolved their chronic back problems. You should have someone spotting you when you’re first starting out and you may get dizziness from inversion but mostly you’ll get used to the inversion therapy in a few days or a week. 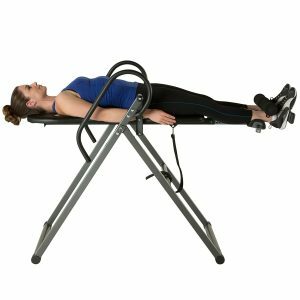 This inversion table is made in China like most other products these days and comes very well packaged and with one year of limited warranty. Please note that this is a UL certified product meaning it meets the security standards of UL.